I am travelling in a soft bubble of light, a glowing hemisphere that reaches 20 feet in front of me. The light is emanating from a torch worn around my waist, and beyond the bubble is inky blackness. An hour away from Montreal’s city lights and under the thick cover of deciduous trees, the night in Bromont, Quebec is very, very dark. Earlier today the landscape was resplendent in fall colours, maple leaves beginning to turn in an endless patchwork carpeting the rolling hills. Now under a blanket of darkness, I’m transported from pastoral Eastern Canada to anywhere-land — a glowing orb floating in a sea of nothingness. I’m about 120 km into the 160 km (100-mile) Bromont Ultra, half way through the second of two 50-mile loops and roughly a marathon from the finish. I’ve just been through the aid station Chez Bob (Bob’s place), buoyed along by its jubilant volunteers, and now I’m alone, somewhere on a network of hiking and mountain biking trails around the ski resort. The fact is, I really don’t know where I am. I’m just moving forward, scanning my field of view for the next “drapeau rose,” course marker. The sun has long since set – the autumn light faded quickly – and the ground that I’d visited not twelve hours earlier has become ghostly and menacing. There’s plenty to be afraid of when you’re running in the dark: you might stray off course, or worse, off a cliff. You might encounter a bear, an elusive cougar… or a zombie – your imagination can make anything out of nothing, but to allow it to do so is to invite paralysis. When I was 12 years old I took on my first morning paper route. I had to deliver before dawn so on my first day I awoke before the rest of my family, got dressed and opened the front door. It was a cold morning and for a minute I stood staring out into the darkness. What greeted me was so eerily still, so alien that I just wanted to close the door and crawl back into bed. But I didn’t. I knew that I needed the money, so I took a deep breath and stepped over the threshold. I had that paper route for several years and I have no recollection of the route itself, but I vividly remember what I felt on that first day. I’m brought back to that moment now as I run in the dark and imagine the perils that may lurk ahead. The darkness in the forest is thick and impenetrable. Occasionally, I catch movement in my periphery which spikes my adrenalin: a mouse darts across my path or the silvery form of a deer looms just off-trail. I push the fear aside – I’ve been here before. Not “here-here” but back on the small island where I live I’d spent many winter mornings running in the dark on forested mountains with only my torch and the hooting barred owls to guide me. In my bubble of light, I could be anywhere – I could be home. With training, I’ve turned the darkness into an ally — a shield that allows me to put aside the unknown and the unknowable, the past and the future, and focus on what’s right in front of me, the twenty feet ahead. My first hundred-mile attempt ended in failure — I dropped out after 66 km — so when I signed up for another one, I felt a combination of regret and exhilaration. I’d had first-hand experience with how a hundred-miler can chew you up and spit you out, so why would I willingly invite this level of stress again? Perhaps I needed something to shake me out of the modern state of “hyper-comfort” we all enjoy. Or maybe it’s that I knew that what helps me to move forward as a person is to attempt things that seem impossible. Whatever the reason, the lead-up to my second hundred mile race felt like an inexorable march towards a void, an empty vessel to fill with my speculations, insecurities and irrational fears. Things were not ideal for me in the weeks before the Bromont Ultra. After building my training year around my goal race, the Fat Dog 120, the race was cancelled due to forest fires just two days before it was to start, and I had to quickly decide if I wanted to find a “make-up” race. Pickings were slim that late in the year, but fortunately Bromont, still two months away, had space. I recalibrated my training in an attempt to “re-peak,” fitting it all in around an overseas work trip I’d already committed to. Then ten days before the race my youngest son developed a wicked fever. His symptoms migrated to my wife, Elise, and then to me. I developed a phlegmy cough and sore throat that wouldn’t go away. And then I had to fly across the country to Quebec, three time zones away, where the forecast for the race was for rain, rain, rain. Things were not ideal. We all dream of the perfect day – that mythical race where everything falls into place. I had spent the last ten days chugging echinacea and performing exorcisms but to no avail – my illness would not be licked in time. Yet something about the imperfection of my circumstances helped me to let go. Life is not perfect, and running an ultra is an untidy affair filled with sweat, mud, blood and snot. You might find yourself on the side of the trail, moaning, crying or relieving yourself. At times you feel invincible and at others, you’re your absolute worst. So why worry about perfection? If I felt poorly the morning of the race, well, I wasn’t really expecting to feel brilliant running 100 miles anyway, was I? I decided that whatever the circumstances, “tomorrow was going to be awesome.” I would be venturing into the unknown and I would be running in the mountains. Whatever the experience, it was going to be new and perhaps bring the unexpected – and that was exciting. Strangely, this was not a moment of positive self-talk: I wasn’t convincing myself of anything. It was a surprising release of expectation in favour of experience, worry replaced by equanimity. As I went to bed feeling a flood of unreasonable calmness, I realized the race had already begun, and I slept like a baby. I’m running down a stretch of pavement, a short section bridging the gap between mountain trails. Sporadic gusts of wind whip drops of rain into my face as I pass the darkened windows of luxurious rural homes, whose occupants sleep silently, unaware of the pilgrimage that is happening all around. The flat, non-technical surface is a welcome break from the rocky, rooty single-track which characterizes much of the course. I find a pace that feels easy, allowing my mind and body to rest. I imagine I’m at home, relaxing on the sofa and recall the many times that I actually was at home relaxing on the sofa and daydreaming of running a 100 miles. I see if I can feel that same level of ease and for moments, I can. I have done this dozens of times today — checking in on myself and looking for that place of effortlessness — and mostly I’ve been able to find it. Mostly. When I first started running ultras I was attracted to the hyperbole of it: I wanted to push myself to extremes and be able to say “that was the hardest thing I’ve ever done.” But as I’ve run more races, I’ve realized that this is the “Red Bull” vision of ultras. What I’ve discovered is something much different: Ultras force you to ask yourself questions that you don’t have ready answers to, not the least of which is “how do you cope?” It’s how you answer these questions that determines what you’re willing to put into an ultra and ultimately, what you get out. In my case, my entire strategy came to revolve around a single word: enjoy. I’d learned that somewhere beneath the toil and slog, through the endless miles and aching muscles, is joy — a type of raw contentment that is only possible when I peel back the layers of my assumptions and disquietudes, predispositions and suppositions, skeletons of the past and spectres of the future. Underneath it all is an animal that just wants to move — but finding it is not easy. To get there, I needed to start with the practical. Barring unforeseen catastrophes, there were two main pitfalls that could sabotage my race: loss of will and unbearable suffering. I believed that I could hold both of them off if I could create and maintain a body-mind environment that allowed positivity to flourish. Sustainable pacing would be vital, and this would mean not only managing speed, (or lack thereof) but also expectations. The unique challenge of ultras is, unsurprisingly, their length. For “shorter” races (say, sub-marathon), one can spend a lot of energy fretting about pace, splits, minutes and seconds. But when you know you will be running all day and all night, there’s no need to be in a hurry. In fact, it’s much better to relax into the process and stay in a “parasympathetic” state, as stress can exhaust you as much as running. Taking a bit of time to take in the scenery, enjoy the aid station hospitality, and greet your fellow runners can be the difference between getting to the finish line and a DNF. Eating would be equally important. Some have called ultra marathons “eating contests” and with good reason. There’s nothing that will make your spirits turn south quicker than a lack of nutrition. While I could get by on little food by drawing heavily on body fat, experience had taught me that I would enjoy my race a whole lot more by eating, and eating a lot. The final and most important piece of the puzzle was my mental state. I’d spent a long time, years even, practicing being objective and in the present in daily life and this was the approach I would bring to the race. While running, I planned to regularly ask myself the question: “how do I feel right now?”, and to focus solely on the answer to the exclusion of projection or hypotheticals. Simply put, if I felt okay, then things were okay. If I didn’t, then I would make adjustments. As they say: pain is inevitable, suffering is optional. The surest way to suffer is to try to eat the whole whale at once, instead of savouring each delicious bite. My plan, if well-executed, should result in my ability to maintain a positive attitude and sense of well-being, and generally know that everything would be okay. This, in turn, would help me to overcome challenges that I may otherwise suffer through, and maybe even have a little fun. Focusing on enjoyment may seem trite and a bit paradoxical in the context of an ultra, but honestly, if I was going to choose to spend a large portion of my life doing something, why wouldn’t I make enjoying myself the primary objective? Ultimately, if I enjoyed the experience, then I would consider it a success on every level. It’s raining steadily now and mist has descended over the mountains. The lack of visibility intensifies my focus, my eyes constantly scanning for the next pink flag. Though I’m mostly sheltered by the tree canopy, the raindrops that make it through are heavy, having rolled off leaves and gathered mass, and are pelting my nylon hood like wasps on a windshield. An occasional blast of wind shakes loose a cascade of fat rain — I am soaked to the bone. The trail switchbacks its way up and down the mountain and is rocky and technical, with sections of sculpted banks and ramps built for courageous mountain bikers. The rain has liquefied dirt, lubricated rocks and pooled wherever it can. I lose traction on a sloping rock, fall hard on my back and am momentarily winded. I grunt loudly and curse – then laugh out loud as I pick myself up. I am soaked and muddy, battered and bleary, but I’m oddly giddy and feeling genuinely happy. I am still okay. In fact, I’m more than okay – I feel acutely alive and immersed in experience, my sense of time and place subjugated to the simple act of moving. At this moment, there is nowhere I’d rather be. Almost imperceptibly, light is starting to bring the world back into focus – the earth is completing a revolution. Dawn turns to day and only half who started this journey remain – each of us tiny specks moving across a vast landscape. We are transforming the unimaginable into reality, challenging the impossible, one step at a time. As I cross the finish line, I am overtaken by emotion. But I’m also struck by the quietude — it was only yesterday that finishing was just an idea. After a hundred miles I am back where I began. I accomplished something I wasn’t sure I could accomplish and redefined what I consider impossible. And though it’s an overstatement to call it “life-changing,” in small and subtle ways, it was — I found rhythm in relentlessness and ease within discomfort, and I emerged just a little bit stronger. And above of all, I found a way to enjoy it. 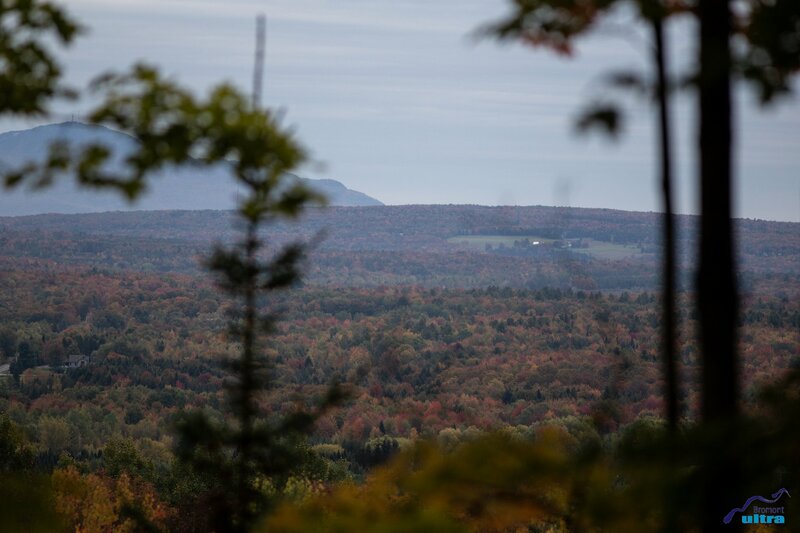 The Bromont Ultra series of events has distances for runners from 2km all the way up to 160 km, as well as several mountain bike races. The 160 km calls itself “the toughest 100-miler east of the Rockies” and it makes a decent case for this claim. With almost 7000 m (~23,000 ft) of elevation gain and loss and only 6% of flat running, it certainly is a stout challenge. Within its two 50-mile loops it boasts plenty of technical single-track, some wide open ski runs and forest roads, and large stretches of relentless ascending and descending. In 2018, 98 people started the 160k, and 49 finished under the 35 hour limit. The race is 100% volunteer-run and a portion of all entry fees go to charity. In 2018, they donated over $200,000 to various charities. The fabulous volunteers and sponsors put on an excellent, professional event that was a joy to participate in. The venue was excellent with a giant heated tent, food and medical staff on site. They used electronic timing with scan tags at checkpoints, so you family and friends could track your progress. My only major source of trepidation was my poor, high-school-level French. Thankfully, though, all critical information was translated. The rest I managed to muddle my way through. The town of Bromont is an hour’s drive from the airport in Montreal. It’s picturesque and has plenty of food and accommodations.